What is the significance of August 15? Religion > What is the significance of August 15? Each year on August 15 or Dekapentavgoustos on the Greek Orthodox Christian calendar, the Feast of the Dormition of the Theotokos is celebrated. It is a national and religious holiday that marks the “falling asleep,” repose or kimisis of the Virgin Mary, mother of the Lord Jesus Christ. The Feast also commemorates the Assumption of the body of the Theotokos into heaven. According to the Holy Scriptures, Christ was dying on the cross and saw His mother and His disciple John. He said, “Woman, behold your son!” to the Virgin Mary and “Behold your mother!” to John. From that moment, Apostle John took care of the Virgin Mary/Theotokos at his home in Jerusalem. The Virgin Mary was with the Holy Apostles on the day of Pentecost — a moveable feast that occurs 50 days after Pascha that marks the descent of the Holy Spirit and the culmination of the Holy Trinity — and continued a ministry in word and deed. 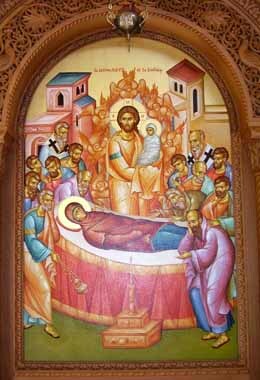 All of the Apostles except Apostle Thomas were at her bedside when she “fell asleep,” and the Lord Jesus Christ came down and carried her soul to heaven. The body of the Theotokos was laid in a tomb near the Garden of Gethsemane, but the tomb was empty three days later when Apostle Thomas went to see her. The assumption of the Theotokos (the body) was later confirmed by an angel and by an appearance She made in front of the Apostles. Commemorating and preparing for the Dormition of the Theotokos begins on August 1 with a period of strict fasting that dictates no meat, dairy, oil or wine, except for fish on the Feast of the Transfiguration on August 6, and the day of the Dormition on August 15. Oil and wine are allowed on Saturdays and Sundays. Paraklesis services are performed by most parishes on weekdays before the Feast, which consist of supplication and prayer for the intercessions of the Theotokos. A Great Vespers is held the evening before the Feast, and the Feast itself is celebrated with the Divine Liturgy of John Chrysostom in the morning. Everyone with a derivative of the names Maria, Despina and Panagiotis should be wished Chronia Polla (Many Years). See the name day widget in the right column for help. Devout Christians make a pilgrimage to the Greek island of Tinos, where legend says the Virgin Mary appeared before a nun and told her where to find an icon of the Panagia that holds healing properties. On the island, there is also a monument for the destroyer “Elli,” where a wreath is laid on the evening of August 14 to commemorate where it was sunk in 1940, followed by an evening, matins and morning service, then a military parade, religious procession and several events that last well into evening. Some Greeks, primarily from the Pontic region of the southeastern Black Sea coast, flock to the Panagia Soumela monastery on Mount Vermio. The devout also gather at the Panagia Ekatontapyliani (Hundred Doors) in Paros, where it is said that Helen docked her boat and found the Holy Cross, then a temple was built. There are also a number of smaller but no less significant celebrations in Alonissos, Andros, Amorgos, Arkadia, Astypalaia, Folegandros, Ioannina, Ithaca, Karpathos, Kassos, Kefallonia, Koufonisia, Lesvos, Nisyros, Serifos, Tzia and village squares all over Greece, with some lasting up to nine days. That’s absolutely true, however I wrote the post so people here in Greece — where Orthodox Christianity reigns — understand why we’re taking the day off. I believe people are as spiritual as they want to be, either because of or in spite of religion.